Might be a while there. College didn't really leave enough uninterrupted time for me to really finish the 1.7.10 version to my satisfaction, and I've made enough gradual improvements there that I still want one final well-polished 1.7.10 release before making a mad rush through all of the Minecraft versions that have emerged since. Plus, the modpacks that I really want to finish playing are still for 1.7.10, and using the mod has been my primary motivation for improving it. In more general news, I recently got some work done on it, notably including a major optimization (really, a performance fix, things were already far too slow) when putting together the recipe list, and created a nicer API alternative (no manual coordinates; method calls declaring data rather than manually creating arrays; support for automatic shaped and shapeless item grids). Also, because it has been too long already, I put a build of it on CurseForge although since it's marked as alpha I don't think it will appear on curse, and might not appear in the curse launcher. will you fix compass and clock cheats ? I was about to report some BTW recipes where wrong but you already fix them! This mod is great and BTW getting support is great and you are a great person for making this mod. I don't know how useful that would be; anyone who wants to cheat would just use an old version of the mod. OTOH, if I can still find the old development environment and get it to work, I might get around to fixing that eventually. Finally finishing with MC 1.7.10 takes priority, although with the relative scale of the work involved, it might happen before then. I would be happy to assist. I have some free time on Thursdays. Can I add my own recipe to this book, for example for the furniture mod, can i put in my own recipe for an item of that mod? There's a critical error you forgot to fix! You forgot to synchronize() the field in ItemType.java:199 ! It causes me to crash every time I open it and I need it to be fixed or have someone help me. If it's a vanilla Shaped or Shapeless recipe, or one of Forge's Ore equivalents, and it's listed by vanilla's crafting manager (almost every mod recipe that can be crafted at a workbench meets those criteria), it's there automatically. There is an API that mods can use to show other recipes, although I still haven't set up a way that modpacks could display custom recipes with just a config file. The API currently offers three ways to display recipes. One, a single interface that basically gives you whatever size of screen rectangle you ask for, and a few method calls to handle drawing and user interaction. On top of that, the API builds a "template" abstraction, where you describe how the recipe is laid out (by making an array of Slot instances), then make recipe instances by combining that template with arrays of objects containing the data used by each slot (typically an ItemStack or List<ItemStack>, although some of the Slot types differ). The idea there is that the logic to render an item, or a liquid, or show power usage, or whatever only needs to be written once (as an example implementation, the LiquidSlot in the API itself is entirely self-contained), but that API is unfortunately somewhat inconventient, as you still have to manually position each Slot, and crafting grids (especially shapeless ones!) have to be created one slot at a time, and it's extra work filling the object array for a recipe instance. With the recent alpha, I added a third API style, built on top of the Slot system, that does layout for you (although it just places things in columns, and you have to tell it when to move to the next one, and how many pixels of a gap to leave), and supports adding both shaped and shapeless item grids as a single method call. Rather than making an array of slots and then many arrays of objects, you make a template object using chained method calls, and make a recipe instance my using a similar chain of method calls on the template object. The new API has a few downsides, notably that older versions of the mod don't support it (although any proper release for Minecraft 1.8 or later will, unless someone has already been making releases for those versions, in which case I encourage them to incorperate the new API; it's so much nicer), and it doesn't support custom slot types (although, I could implement that, maybe? That bit of API isn't quite set in stone at the moment, and the interface listing the methods is not intended for others to implement so if anyone did (someone could theoretically have a compatible API implementation that targetted multiple recipe viewers? ), it would be up to them to fix any breakage). which would be decent for a machine that takes up to for inputs in any order, and produces a FluidStack. Using the older API, you would need to manually position each of the four inputs, and it would be too much work to give it a single rectangular background (the UI convention I use for "shapeless recipe") so each slot would probably draw its own background instance, and you would need to loop over the inputs copying them to the object array. Will this be for 1.10.2? While updates to MC 1.8, 1.9, 1.10, 1.11, and 1.12 are still future plans, I just pushed an update to CurseForge with some more recent minor improvements: You can add liquids to an item search, and the item list text search is now on a separate thread, so that typing multiple characters is far more responsive. That build is still marked alpha, though, so it won't appear on Curse or in the Curse Twitch client. For mod developers, I wrote up some examples using the newer API I've been working on. Are there any plans to add the ability to craft the items? Not just give them to yourself (like NEI) but actually use items from your inventory? 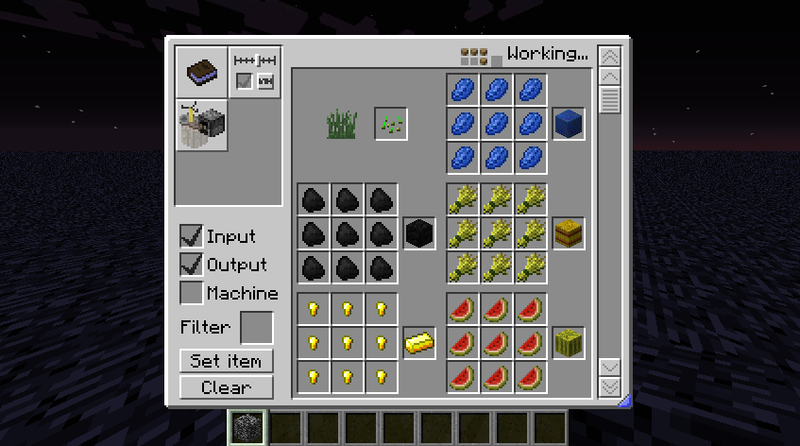 Basically, could this mod be the Recipe Book (newly added in 1.12) for earlier versions? Long ago, there was an idea that you could pin recipes to the edges and corners of your screen, where they would remain as a semitransparent HUD element. The ultimate idea was that you would be able to click on it to pick up a ghostly copy, then "stamp" that copy to transfer items, with a quantity varying with left/right click and whether shift was held. The idea was to generalize it so that you could put patterns into chests, or the side of your inventory that Factorization's pocket crafting table used, or directly into crafting tables as usual. You also would be able to have a "TODO HUD", as a reminder of what you were working towards. Obviously, I never got around to that feature, but there is a tiny piece of code, still lingering around from 2012, that just barely hints at it. With how little I've accomplished lately, I'm thinking I might skip polishing the 1.7.10 version (or at least prioritize one or two things and leave the rest for later). I finally got around to working on a separate download page. It's not fully functional (it's missing the actual download part, for example), and it doesn't have proper downloads set up yet, but it currently has the functionality to read a version list and changelogs. You can see it here. New beta release! Find it on CurseForge or my work-in-progress download page. Notable changes to the theme .xml format: I didn't realize it before, but all image coordinates assumed the image was 256x256 pixels. This has been corrected, finally, for images loaded as a file. I added an animation tag. Values can now support optional units. The units are unfortunately not documented anywhere yet, but for example frame durations support seconds (default if no suffix present), milliseconds, and ticks (including shorthands s, ms, and t, and both plural and non-plural forms). If no major bugs turn up during the next week, I'll finally start moving on past 1.7.10! It's been a week and I haven't heard about any bugs, so I'll be making a proper release soonish. Working towards it being the final non-bugfix release for 1.7.10, I've been going over some last API refinements and implementation. I might have mentioned before, but in the process of playing various modpacks, I gradually built a small recipe support pack for personal use. Since it would be very useful for planning in a current IE:S world, I've been considering what would be required to show ThaumCraft recipes, and making aspect handling convenient has inspired a few further changes. While none of that recipe support will be integrated into the mod, I might post a download link for the extension later. It's very incomplete, though, containing whatever I felt would be useful at the time, or easy to add, or a set of recipes I wanted to see for planning. So my current goal is to finish a last few bits of the main mod with the goal of not needing anything new added to the core API, so I don't need to port/backport any changes once main development finally shifts to 1.8.9, then 1.9.x, and so on. Current timeline is uncertain, so I may finish it today (although I'll want to spend some time exercising the API changes to minimize the chance that it'll need a bugfix later), or some time during the coming week. A proper release version for the first time in years! Hopefully the last needed for Minecraft 1.7.10. It's not polished, or complete, there's no guarantees that it is bug-free (in fact, it almost certainly breaks mid-thaumcraft), and it almost certainly has a fragment of testing code left in from when I was making sure icons worked with the last API changes. It has partial support for an assortment of mods that I wanted information on while playing PO2R and IE:S.
Since development is no longer utterly stagnant I've set up a Patreon page, though I'd prefer people didn't use it. Then again, I strongly suspect I undervalue my own work habitually, so who am I to tell you what you should or should not do on that matter. 1.8.9 version released! On to 1.9! I think I'll stop once I reach 1.10 for a while, I want to change the hold-shift/hold-crtl feature from an icon that appears only while active, to a row of buttons below the filter. If you've user more advanced image editing software, you've probably seen something like it in the selection tool, where you can pick "change selection", "combine selections", "remove from selection", or "intersect selections". Having the buttons should reduce need for the keyboard, but more importantly make the feature vastly more discoverable (and the shortcuts can be put in tooltips). It would also free up UI space for a "previous filter" button, a feature I've started to want a lot recently. Also, 1.10 is where the modpack density returns to near-1.7.10 levels, so it'll be important to give time for obscure bugs to turn up. perhaps make branches on github for post 1.10 versions that you can release as beta builds, one release each, while the main repository and releases stay on 1.10. Then when you're finally ready to move on, you can push the changes from the 1.10 (main) branch to the other branches, as well as also having later versions out that people can search for bugs and list them as issues that would either be fixed in the main branch already or that would need to be fixed for those specific versions. This would both allow players with newer modpacks/servers to use your mod and cut down on some of the time that you'd need to have a version out before you find bugs. Sorry if that sounded slightly incoherent, it's been a long day already. Keep track of the latest news and updates by following my twitter! Feel like playing MC with me? Join me on the official PC Gamer US server here!